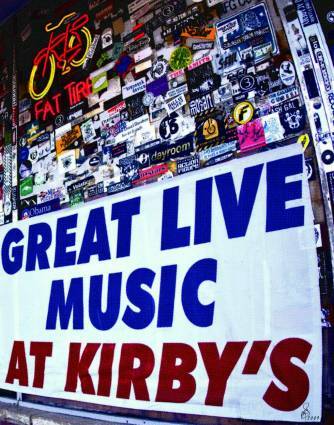 Founded in 1973, Kirby's is a long standing mainstay of the Wichita live music community. With music nearly every night of the week, and never a cover charge, we are Wichita's premier hole-in-the-wall. Kirbys is the smallest bar you'll ever go to, but it will have a huge impact on you. Music acts from all over the country make a point to play in this beyond-cozy dive bar with more character than a Kurt Vonnegut novel. Always 100% free to the public. Kirby’s has been hosting bands for over 30 years. In size, it compares to most living rooms, if most living rooms contained a bar, a stage, and a jukebox.